In this Nov. 6, 2018, file photo, Georgia Democratic gubernatorial candidate Stacey Abrams addresses supporters during an election night watch party in Atlanta. A political organization backed by Democrat Stacey Abrams filed a federal lawsuit Tuesday challenging the way Georgia's elections are run, making good on a promise Abrams made as she ended her bid to become the state's governor. The lawsuit was filed in Atlanta by Fair Fight Action against interim Secretary of State Robyn Crittenden and state election board members. It asks a judge to correct problems with the state's elections system. 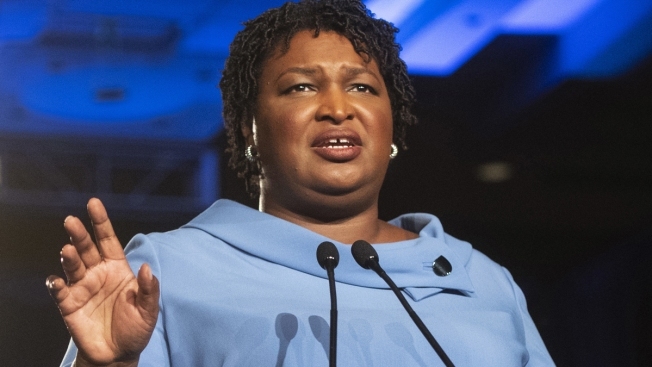 In a fiery speech ending her campaign Nov. 16, Abrams announced that a lawsuit would be filed against Georgia "for the gross mismanagement of this election and to protect future elections from unconstitutional actions." As secretary of state, Abrams' opponent, Republican Gov.-elect Brian Kemp, was the top elections official until he declared himself the winner and resigned two days after the election. On the campaign trail, Abrams repeatedly called Kemp "an architect of suppression." It's still a fight to the finish in Florida a week after Election Day, with razor-thin margins forcing a recount in both the Senate and Governor's races. Meanwhile, Georgia is facing its own elections problem as gubernatorial candidate Stacey Abrams fight for a recount. Flanked by Democratic state lawmakers at the Georgia Capitol earlier this month, Abrams' campaign manager who's now CEO of Fair Fight Action, Lauren Groh-Wargo, said the campaign believed Kemp "mismanaged this election to sway it in his favor." Abrams didn't end her bid to be the first black female state governor in U.S. history until 10 days after the election, insisting efforts to suppress turnout had left thousands of ballots uncounted that otherwise could erode Kemp's lead and force a runoff election. Abrams said the election was marred by systemic voter suppression. She rattled off a list of concerns, pointing to absentee ballots thrown out by what she called "the handwriting police;" a shortage of paper ballots to back up broken voting machines; and Georgia's so-called "exact match" voter registration rules that require information on voter applications to precisely match state or federal files. Joining Fair Fight as a plaintiff in the lawsuit is Care in Action Georgia, the state chapter of a national nonprofit dedicated to fighting for the rights of domestic workers.